Pat the beef dry and cut into bite-size pieces. In a large skillet or Dutch oven, heat the oil over high heat until smoking. Working in 2 batches, cook the beef until browned on all sides, 2-3 minutes. Season with salt and pepper and transfer to a plate. Lower the heat to medium, add the bell peppers and cook, stirring, until softened, about 10 minutes. Transfer to the plate with the meat. Add the butter to the skillet. Add the shallots and garlic and cook until fragrant, 2-3 minutes. Sprinkle the flour into the pan and whisk in the sherry, scraping up the browned bits from the bottom of the pan. Stir in the beef broth and curry powder. Return the meat and peppers and any juices to the pan and simmer to combine the flavors, 2-3 minutes. Season with salt and pepper. In Recipes-list.com we have selected the most viewed recipes from category - uncategorized . Enjoy the best recipes specially selected for you! 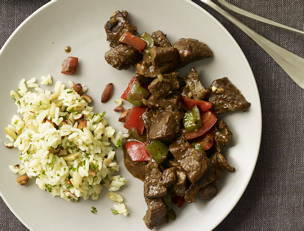 Curry Pepper Beef with Smoked Almond Pilaf is the right choice that will satisfy all your claims.